Our newest project has taken place from September 28th till October 3rd 2015 in Belgrade, Serbia. 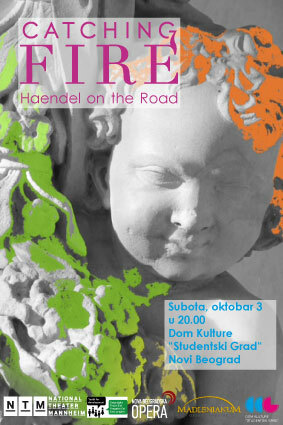 We have studied Haendel’s Orlando, an opera about the discovery of the emotional turbulences of first love. Up to 30 young people were working together with professional musicians under the guidance of Francesco Damiani, Anabel Heiden, Veronica Peyer, Robin Philips and Georg Schütky (workshop leaders) as well as Marijana Mijanović and Predrag Gosta (musical coaching). A public presentation was held on October 3rd at the Students Cultural Centre, Belgrade. From the end of October onwards the students will have the possibility to see a full-scale staging of the opera Orlando at the Madlenianum Theatre in Belgrade (Musical direction: Predrag Gosta, Mise en scène: Alvaro Schoeck). The Young Opera department of the Nationaltheater Mannheim is starring Haendel in its 2015/16 season! In cooperation with the Staatliche Hochschule für Musik Mannheim the Young Opera department of the Nationaltheater Mannheim will create Amor: an opera for teenagers based on Haendel with original baroque music, Jazz-elements as well as new composed pieces (concept: Francesco Damiani, Merle Fahrholz, Sybrand van der Werf). The premiere is on April 23rd at the Nationaltheater Mannheim. Combined with Amor will be the educational project Haendel on fire (concept: Merle Fahrholz, Johannes Gaudet, Alvaro Schoeck) in cooperation with the Musikschule Mannheim as well as the Staatliche Hochschule für Musik Mannheim. Public performances will be held on Mai 22nd at the Musikschule Mannheim.